Freaks, magicians, psychics, and the passing strange take center stage in ten original tales by top YA authors and graphic novelists. Molly is a bearded girl who joins the circus, only to fi nd that her former tormentor faces a far hairier plight. Tia claims that her lamented mom is a three-thousand-year-old mummy, but is it really an act? Cody sets out to foil a pop psychic, but the shocking result is not what he planned for. And Tiffany’s grandma sees something wild in her future, but is the girl prepared for the powerful shape it will take? 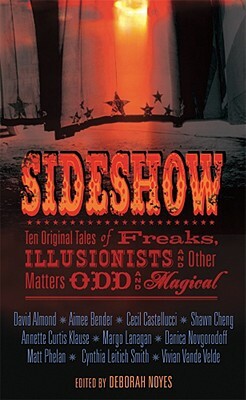 Whether the sideshow touts a two-headed rat or a turn-of-the-century American jargo, whether the subject discovers an odd kind of miracle or learns that the real freaks are outside the tent, these stories and graphic tales are by turns humorous and insightful, edgy and eerie, but always compulsively entertaining. Editor Deborah Noyes is the acclaimed anthologist of the award-winning collections THE RESTLESS DEAD and GOTHIC! She is also the author of the gothic collection of connected stories THE GHOSTS OF KERFOL, as well as the picture books RED BUTTERFLY and HANA IN THE TIME OF THE TULIPS. She lives in Somerville, Massachusetts.